David Bowie, T Rex, Robert Wyatt, Codeine, Diabologum and more. This show was 11th in the global rock chart and 19th in the global indie chart. 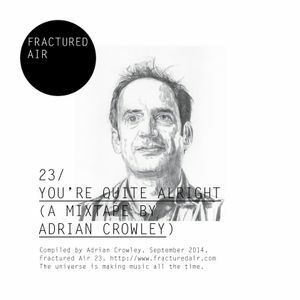 Irish songwriter Adrian Crowley returns with his hugely anticipated seventh studio album, ‘Some Blue Morning’, this November via Glasgow-based independent label Chemikal Underground. The follow-up to Crowley’s masterful 2012 Choice Music Prize nominated ‘I See Three Birds Flying’ will feature contributions from Seti The First’s Kevin Murphy on cello; Dublin-based songwriter Katie Kim on vocals and members of London string ensemble Geese, amongst many more. After a series of wonderfully received live performances last year across Europe, Scandinavia, UK and Ireland, Crowley returns to the stage to promote ‘Some Blue Morning’ this Autumn.